ForTii® MX1 by DSM is a heat stabilized, high performance polyphthalamide based on polyamide 4T grade, reinforced with 30% glass fiber. It is partially aromatic, semi-crystalline and an alternative to die-casting metals. Possesses good mechanical strength, heat deflection temperature and good toughness across a broad range of temperature. Exhibits good impact strength and high dimensional stability at ambient elevated (100°C). 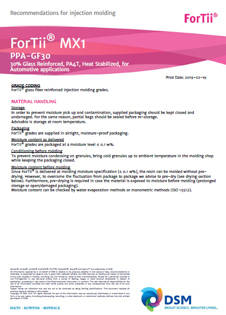 ForTii® MX1 is suitable for processing by injection molding. Used in automotive applications.